If you’ve been following me on Twitter recently, you may have seen me mention the Cambridge & District Campaign For Real Ale (CAMRA) Awards. The Awards are aimed at celebrating all that is good about our local pubs and their achievements over the last twelve months, and this year’s ceremony was held on Tuesday at The Hopbine. The evening saw presentations in eleven different categories – ranging from Most Improved, Dark Ale/Mild and Cider Pub of the Year through to Community, Lifetime Achievement and of course the coveted Cambridge & District CAMRA Pub of the Year accolade. I followed the evening’s proceedings on Twitter and it was great to hear that some of our pubs in the Mill Road area were on the receiving end of the presentations – The Cambridge Blue, on Gwydir Street, won the city Locale Pub of the Year (the runner up was The Hopbine) and was also runner up in the Dark Ale/Mild Pub of the Year category (the winner was The Maypole); meanwhile The Geldart, on Ainsworth Street, scooped the runner up position in the Community pub of the Year (city) category (the winner was The Elm Tree). A special mention must of course go to The Flying Pig on Hills Road – they won the much sought after Pub of the Year award, which I think is highly deserved. As you may be aware, The Flying Pig has been under threat given the developments going on in the station area and there has been a campaign to save it. Although winning the award has hopefully helped the campaign (a newspaper headline such as “Pub of The Year demolished to make way for development” wouldn’t go down well at all…) the fight to save it is not yet over. If you want to help the campaign and keep up to date with what’s happening then you can follow ‘Save The Flying Pig’ on facebook and Twitter. For more information and full event details, please check with the venues. The list above doesn’t cover everything that’s going on this week – there’s plenty more and often last-minute gigs are arranged, so keep your eyes peeled for updates. 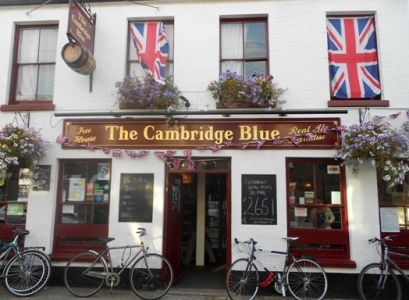 As many of you will know, the planning inspectorate announced a couple of weeks ago that it is upholding Cambridge City Council’s decision not to turn the Royal Standard pub on Mill Road pub into housing. This is good news for Romsey residents, who are keen to see the historic building retained and re-opened as a pub – though the next step towards making sure this happens is to find someone willing to take it on. You can read a copy of the appeal decision here and there’s also more information in the recent Cambridge News article. After the Royal Standard’s recent plight, it occurred to me that we’ve lost rather a lot of pubs in the area in recent years – by my calculations… nearly 40% of pubs have been lost in the Mill Road area since the year 2000! With this in mind, I’ve been thinking about some of the establishments that have been consigned to history and thought I would share some of my memories. Not that I would call myself a pub frequenter, but I have visited almost all the pubs on the above list at one time or another and can perhaps offer a brief glimpse into their (former) characters. 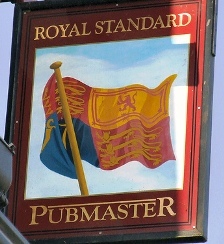 Given that there’s rather a lot of lost pubs it could make for a very long article indeed… So for now, I am just going to talk about three of them – The Royal Standard, The White Hart and The Duke of Argyle. The Royal Standard My first visit to the Royal Standard was about ten (ish) years ago, when Mary (formerly of The Geldart, and more recently of Romsey Labour Club) was the landlady. She’d done well at her other pubs and her reputation put her in good stead to make a success of this one. I remember my first visit – Mary was very polite and managed to make the hard work of running a pub seem effortless whilst being extremely efficient at the same time. The pub had two different bars with two different atmospheres – the main bar seemed fairly loud and was where most of the regulars tended to congregate and play pool; whereas the lounge bar had more seating and was usually a bit quieter. Mary eventually moved to the Romsey Labour Club. Wendy and John (formerly of The Brook and The Bakers Yard) moved to the Royal Standard back in 2005. I remember visiting a few days after they took over and they were excited about their new venture. 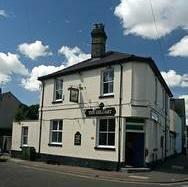 I did drink in there a few times, but my visits began to peter out when I joined a pub quiz team nearer to my house. 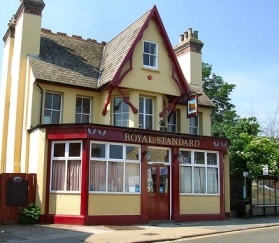 The Royal Standard eventually became a restaurant serving Indian and Thai food. When I first heard about this I was disappointed that the pub had closed, but vowed to try the cuisine. However, already faced with a large choice of Indian food outlets in the Mill Road area, I never quite seemed to make it as far as the Standard under its restaurant guise. The Standard has had many different landlords over the years, and long before I moved to Cambridge these included Dave (formerly of the Empress) and a gentleman called Arthur Cooper – in whose honour the aptly named ‘Royal Standard’ horseracing syndicate continues to exist. 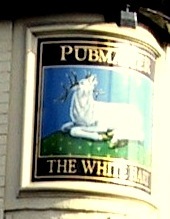 The pub also used to host some of Cambridge CAMRA‘s meetings back in the 1980’s. 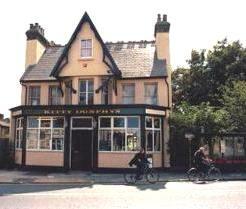 It has also had different names and at one stage in the late 1990s was known as Kitty Dunphy’s. Although the Standard is currently closed, I really do hope it will open again soon as a pub. Personally, I would like to see it serving food and be the kind of place that I could equally meet a friend for lunch or enjoy a night out with a group of friends. The fact that there are two different parts to the pub could be a great asset, as it widens the customer base that it could appeal to. Although I never saw it, I think there also used to be an upstairs function room – which could open up the pub’s potential even further, for example it could be used as a meeting space by local community groups. One of the things that stands out about the Royal Standard site is the potential for it to have a really good outdoor space. It’s a great shame that two large trees were chopped down a couple of years ago, but this does at least show how much space there is on the site. I would like to see new trees planted and the garden made into a welcoming place with some flowers and nicely decorated picnic tables. Whoever takes the pub on could even consider allowing locals to create and maintain it – it would give the community a sense of involvement and help them shape their local pub, as well as create a lovely green space. 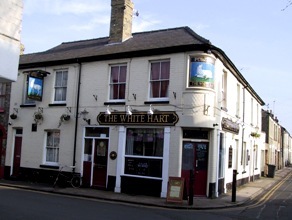 The White Hart The White Hart was a family run pub on the corner of Sturton Street and Hooper Street and my first visit was back in 1997. It had a main bar area, a lounge bar and a pool area. The pool table (which was well maintained and a good table to play on) was usually busy – in fact some of the pubs customers were former UK champion level pool players, so if you ever managed to beat one of them you knew you weren’t doing too badly at all! The landlord and landlady were usually about and there was a loyal local crowd to be found in there most evenings (and indeed daytimes). It was also a popular pub for pub-crawlers, and large groups such as stag parties or those on the snakes and ladders pub crawl would sometimes turn up for a round or two before moving on to one of the other local drinking establishments. I remember the jukebox (which was free in the daytimes) in the main bar had a rather random selection of tunes and delights such as the Nolan Sisters’ ‘I’m In The Mood For Dancing’ seemed to abound with certain regularity. The lounge bar (which was accessible from the outside via Sturton Street) was quieter and a nice snug area if you wanted to have a quiet chat with a friend. They sold pickled eggs and had a large jar of them in pride of place next to the till. I had never sampled a pickled egg before, but I remember trying one at the White Hart and becoming hooked (though only temporarily – they were never quite the same unless preceded by at least one lager). They didn’t have a particularly extensive selection of food, but I do remember enjoying a lasagne there on more than one occasion. 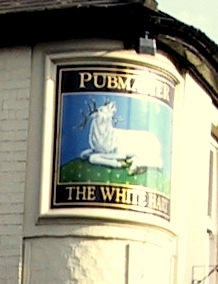 The White Hart’s landlord and landlady moved to another pub (the Man on the Moon, Norfolk Street) in the early 2000’s. Some time after this myself and a friend contacted the brewery as we were interested in taking it on. However, it was too late as they’d signed papers with the new people just hours before – although they did reassure us that the new people had promised to keep it as a pub. But it eventually became the Back Street Bistro and never re-opened as a pub again. 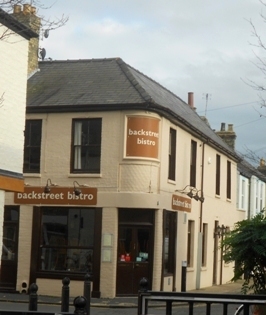 Of course the Back Street Bistro has done very well for itself and built up a loyal following in its time in the area – which is great. But it was unfortunately another local pub lost. The Duke of Argyle The Duke of Argyle was, perhaps unsurprisingly, on Argyle Street. My first visit there was back in the late 1990’s when I was drafted in at the last minute to represent another pub in the Cambridge & District Skittles League. I had never played skittles before (apart from a quick practice about half an hour before we left for the Duke!) but this wasn’t important – it was the taking part that counted. I have to admit it did feel a bit like entering a saloon bar in the Wild West the first time I walked in to the pub – everyone turned around with an air of scepticism to see who this new person was. The Duke of Argyle was slightly off the beaten track and so perhaps wasn’t as used to receiving new customers as some of the pubs on Mill Road itself, but once you made an effort and got chatting to the locals they were a friendly bunch and had some interesting stories to tell. To my team’s (and indeed my) surprise, I wasn’t too bad at skittles and even managed to win one of my games on my inaugural visit. My trips to the Duke after that were very occasional, but I was always made to feel welcome – so welcome in fact, that on one occasion when the owner/manager was talking to friends in the pub and I wanted to buy some more drinks for myself and my group, I was allowed to serve myself (!). 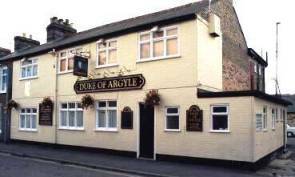 The Duke of Argyle also had an upstairs function room, though I never went to any events there. 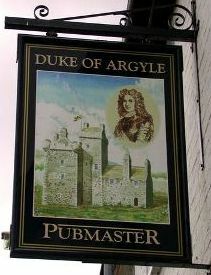 Before the Duke closed a few years ago, there had been local rumours that it would most likely be sold and turned into housing. I remember contacting the brewery about four years ago to find out more, with a view to seeing if it could be used/sold as some kind of community/social housing project – which was (and still is) much needed in the area. But I was told that there was already someone in place to take over, and that in any case the site would not be considered for any kind of demolition/rebuild and that it was company policy not to sell any of their freehold sites. 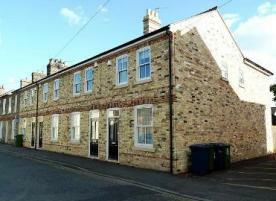 However, it was soon sold, knocked down and turned into housing (!). This was sadly another pub lost to the community AND we still have a dire lack of affordable housing in Romsey. Mill Road’s other lost pubs I’ll write another post soon about some of the other pubs that have disappeared from the area in the last ten years or so. If you know of any I’ve missed or have any stories (or photos) about any of them, then do get in touch: theressomethingaboutmillroad@hotmail.co.uk – I’d love to hear from you and may well be able to feature them in a future post; and if/as and when people can share anything about the pubs on my extended list (see bottom of this article) then I’ll post about those too. 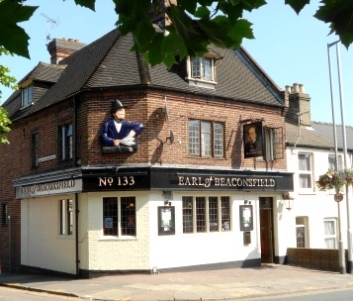 For now though, I am keen to make sure I support my existing local pubs, as the thought of losing any more of them is quite a sobering one – pun fully intended!